2003-07-14 Assigned to CONTENTGUARD HOLDINGS INC. reassignment CONTENTGUARD HOLDINGS INC. ASSIGNMENT OF ASSIGNORS INTEREST (SEE DOCUMENT FOR DETAILS). Assignors: DEMARTINI, THOMAS, RALEY, MICHAEL, HAM, MANUEL, LAO, GUILLERMO, TADAYON, BIJAN, GILLIAM, CHARLES P.
A system and method for creating a rights expression for association with an item for use in a system for controlling use of the item in accordance with the rights expression, including specifying rights expression information indicating a manner of use of an item, the rights expression information including at least one element, the element having a variable and corresponding value for the variable; generating a profile of the rights expression information, including removing the value for the variable from the element; and generating an identification for the profile, whereby the rights expression information can be enforced on a device based on the variable and the identification for the profile. The present invention claims benefit of priority under 35 U.S.C. § 119(e) to commonly assigned, co-pending, U.S. Provisional Patent Application Serial No. 60/363,932 of Raley et al., entitled “USE OF RIGHTS EXPRESSIONS IN APPLICATIONS WITH PERFORMANCE CONSTRAINTS,” filed on Mar. 14, 2002, the entire disclosure of which is hereby incorporated by reference herein. FIG. 10 illustrates an exemplary symbolic representation of a rights expression including a profile or template that can be generated by the Digital Rights Management system of FIG. 1. Referring now to the drawings, wherein like reference numerals designate identical or corresponding parts throughout the several views, and more particularly to FIG. 1 thereof, there is illustrated a Digital Rights Management system  100 that can be used in connection with the described exemplary embodiments to specify and enforce usage rights for content, services, or other property. In FIG. 1, the Digital Rights Management system 100 includes a user activation component in the form of an activation server 110 that issues a set of public and private key pairs 112 to a content user in a protected fashion. Typically, when the user uses the Digital Rights Management system 100 for the first time, the user installs software that, for example, works with, or includes, a rendering application for a particular content format. The software is installed in a client environment  120, for example, such as a computing device associated with the user. The software can be part of the Digital Rights Management system 100 and can be used to access protected content 134. After the installation, the software can be activated. During the activation process, some information is exchanged between the activation server 110 and the client environment 120. A client software component 122 can be downloaded and installed in the client environment 120. The client software component 122 can be tamper resistant and can include the set of public and private key pairs 112 issued by the activation server 110, as well as other components. A rights offer  132 can be associated with the protected content 134 and can specify usage rights 132A that are available to an end-user, for example, when one or more corresponding conditions 132B are satisfied. A license server 140 manages the encryption keys 112 and issues a license 142 for the protected content 134. The license 142 can embody the actual granting of the usage rights 132A to the end user. For example, the rights offer 132 may grant the end user the right to view the protected content 134 on the condition of payment of a fee of five dollars, and the right to print the protected content on the condition of payment of a fee of ten dollars. The license 142 can be issued for the view right when the five dollar fee has been paid and/or for the print right when 10 dollar fee has been paid. The client component 122 interprets and enforces the rights that have been specified in the license 142. Clear content  136, such as unprotected content, and the like, can be prepared, for example, with an application 138, such as a document preparation application, installed on a computer 130 associated with a content publisher, a content distributor, a content service provider, or any other suitable party. Preparation of the clear content 136 can include specifying the usage rights 132A and the conditions 132B under which the clear content 136 can be used, associating the rights offer 132 with the clear content 136, and protecting the clear content 136 with, for example, a cryptography algorithm to generate the protected content 134. A rights language, such as XrML, eXtensible Access Control Markup Language (XACML), Open Digital Rights Language (ODRL), and the like, can be used to specify the rights offer 132. However, the rights offer 132 can be specified in any suitable manner. Note the phrase “specifying rights information”, as used herein, refers to creating, deriving, or other wise utilizing information that relates to rights expressions. Also, the rights offer 132 can be in the form of a pre-defined specification, profile, template, and the like, that can be associated with the protected content 134. Accordingly, the process of specifying the rights offer 132 can include any suitable process for associating rights, conditions, and the like, with content. The rights offer 132 associated with the protected content 134 and the encryption key 112 used to encrypt the clear content 136 can be transmitted to the license server 140. A typical workflow for the Digital Rights Management system  100 can include a user operating within the client environment 120 being activated for receiving the protected content 134 by the activation server 110. The activation process results in the public and private key pair 112, and, for example, some user and/or machine-specific information, and the like, being downloaded to the client environment 120 in the form of the client software component 122. The activation process can be accomplished, for example, at any suitable time prior to the issuing of the license 142. When the user wishes to use the protected content  134, the user makes a request for the protected content 134. For example, the user might browse a Web site running on a Web server 150, using a browser installed in the client environment 120, and attempt to download the protected content 134. During this process, the user may go through a series of steps possibly including a fee transaction, such as in the sale of content, other transactions, such as collection of information, and the like. When the appropriate conditions and other prerequisites, such as the collection of a fee and verification that the user has been activated, are satisfied, the Web server 150 contacts the license server 140, for example, through a secure communications channel, such as a channel using a Secure Sockets Layer (SSL). The license server 140 then generates the license 142 for the protected content 134 and the Web server 150 downloads both the protected content 134 and the license 142. The license 142 can include the appropriate usage rights of the usage rights 132A and can be downloaded from the license server 140 or an associated device. The protected content 134 can be downloaded from the computer 130 associated with a publisher, distributor, or other party. The rights offer 132 can be persistent and remain associated with the protected content 134. The client software component  122 in the client environment 120 can then proceed to interpret the license 142 and allow use of the protected content 134 based on the rights 132A and the conditions 132B specified in the license 142. The interpretation and enforcement of the usage rights, for example, are further described in commonly-assigned U.S. Pat. No. 5,530,235, No. 5,629,980, No. 5,634,012, No. 5,638,443, No. 5,715,403, No. 6,233,684, and No. 6,236,971. The above steps can take place sequentially, approximately simultaneously, in various orders, and the like. The Digital Rights Management system  100 addresses security aspects of protecting the protected content 134. In particular, the Digital Rights Management system 100 can authenticate the license 142 that has been issued by the license server 140. One way to accomplish such authentication is for the client software component 122 to determine if the licenses 142 can be trusted. In other words, the client software component 122 can include the capability to verify and/or validate the cryptographic signature, or other identifying characteristic of the license 142. During the activation step described above, the client environment 120 and the license server 140 can receive the set of keys 112, for example, in a tamper-resistant software package that can include other components, such as the client software component 122 for the activated client environment 120 to verify the signature of the license 142. The Digital Rights Management system  100 is of an exemplary nature and can be implemented in numerous other equivalent arrangements. For example, the license 142 and the protected content 134 can be distributed from different entities. As another example, the rights offer 132 can be associated with the protected content 134 by a party other than the party preparing the protected content 134. As a further example, a clearinghouse 160 can be used to process payment transactions and verify payment prior to issuing the license 142. Moreover, the various processes and transactions can be performed, for example, via online and/or offline environments and/or combinations thereof. For example, an end user could download content to a computer and then transfer the content from the computer to a personal digital assistant (PDA). The end user could then buy a license for the content, for example, via a supermarket kiosk, a cash register, a prep-paid license card, and the like, and then transfer the license to the PDA. The end user could then activate the content for use on the PDA and/or the computer. In such an offline scenario, the various devices can, but need not, communicate directly with one another and information can be exchanged in any suitable manner, such as by physically moving media between the devices. FIG. 2 is a flowchart illustrating an exemplary rights expression profiling process. In FIG. 2, at step  201, for example, the profiling process can include obtaining a license. At step 203, for example, the license can be compared against a profile. At step 205, for example, it is determined whether or not the license is in the profile by comparing the license and the profile to determine if the license and the profile are similar except for having different values for one or more corresponding variable values. If the license is determined to be the profile at step 205, the license can be classified as being in the profile at step 207. Otherwise the license can be classified as being invalid against the profile at step 209. As shown in Table 2, for example, byte  0 can be used for storing information, such as identification numbers for employed algorithms, profiles, or templates, bytes 1-3 can be used for specifying the number x of payload bytes employed for storing compressed or uncompressed data, bytes 4 through x+3 can be used for storing the compressed or uncompressed data, and the like. As shown in Table 3, for example, byte  0 can be used for storing the identification number 1 for the algorithm B for the profile B, or the template T1, bytes 1-3 can be used for storing the number x of payload bytes employed (x=12), and bytes 4 through 15 (x+3) can be used for storing the cmid values 123, 456, and 024 from the exemplary license L1. As shown in Table 4, for example, byte  0 can be used for storing the identification number 2 for the algorithm C for profile C, or the template T2, bytes 1-3 can be used for storing the number x of payload bytes employed (x=16), and bytes 4 through 19 (x+3) can be used for storing the cmid values 123, 456, 789, and 024 from the exemplary license L2. Input W The raw XrML. Input deviceId The device's id. Input songId The song's id. ERROR 2, if the device is incorrect. ERROR 3, if the song does not match. FIG. 3 illustrates an exemplary rights expression encoding and decoding sub-system  300 for resource-constrained devices in the Digital Rights Management system of FIG. 1. In the sub-system of FIG. 3, for example, high-end resources, such as an XrML parser, an XrML interpreter need not be employed for explicit encoding on a resource-constrained device. For example, a device 301 can receive an un-encoded license 303, and instead of parsing the license 303, for example, because of resource constraints, and the like, can employ an explicit encoder 305 to encode the license 303 into a form that the device 301 can later process, advantageously, without having to employ a general-purpose interpreter, and the like, but rather an interpreter 307, such as resource-constrained, or less than full-featured interpreter. The exemplary template T1, or profile B, can include the three variable elements that split the exemplary license L1 into the four parts B1-B4, as shown in Table 5. Advantageously, the parts B1-B4 can be stored as resource strings within the device  301 to enable the device 301 to send, and receive the un-encoded license 303, for example, raw or uncompressed rights expressions (W). If the device  301 can receive a raw XrML string W, the device 301 can call the first exemplary function to determine if the device 301 can exercise a usage right specifying a manner of use, such as playing a song 309. In a similar manner, the device 301 can call a second exemplary function, as shown in Table 7 and in pseudo-code below, to generate an encoded license 311, such as the exemplary license L1. The first exemplary function can be included as part of the interpreter 307 functionality, and the second exemplary function can be included as part of the encoder 305 functionality. Output result ERROR 1, if the license is not a T1. Success. Return the variables from L1. If the exemplary license L1 can be in the profile B of the device  301, as described in T1, then the exemplary license L1 can be encoded by the encoder 305 in an encoded license table by the device 301, for example, as shown in Table 8, and the like. In Table 8, the corresponding 12-byte representation can be interpreted by the device  301, for example, to mean “use a template with identification number 1, fill in the first 3 variables with the values 123, 456, and 024” to generate the license 311. Advantageously, the encoded license 311, for example, corresponding to exemplary license L1, can be extremely compact, by only having to reference a template, or profile, and associated variables thereof, decreasing transmission costs, and storage costs of the exemplary license L1. FIG. 4 is a flowchart illustrating the exemplary rights expression encoding and decoding process of FIG. 3. In FIG. 4, at step  401, for example, the encoding process can include obtaining a license. At step 403, for example, one or more values from variables fields of the license can be extracted until the employed values are removed from the license, as determined at step 405, to generate the template corresponding to the license. At step 407, for example, a template identifier can be assigned, and at step 409 the extracted values and the template identifier can be transmitted as the encoded license. At step  411, for example, the decoding process can include receiving the template identifier along with the extracted values, and step 413 looking up a template corresponding to the template identifier, as determined at step 415. If no corresponding template can be found, step 417 can be employed to obtain a template corresponding to the template identifier, for example from an exemplary templatespace service, as later described. Once a template corresponding to the template identifier is obtained, at step 419 the received values can be inserted into the template corresponding to the template identifier to reconstruct the original license, advantageously, in a lossless manner. For example, FIG. 5 illustrates an exemplary rights expression template mapping sub-system  500 in the Digital Rights Management system of FIG. 1. In FIG. 5, for example, a license A (507) can grant the right to play a piece of content indefinitely within a specific home domain, such as the domain of a device A (505). However, a device B (501) can only support license template B (509), wherein device B (501) can play content between dates D1 to D2, such as given by the template B (509). Typically, it would not be possible for device B ( 501), in this case the slave device, to interpret the license A (507), because the license A (507), for example, does not include the syntax, semantics of “playing between dates D1 and D2.” A user could employ another trusted device, such as the device A (505), in this case the master device, in the home domain for interpreting a wide variety of licenses, such as the license A (507). However, in further exemplary embodiment, the device A (505) can interact with the device B (501), for example, to get a list of templates that device B (501) supports, such as the template B (509), and the like. In further exemplary embodiment, the device A ( 505) can establish a knowledge database including a list of templates that device B (501) can support, via other methods, such as configuration, and registration mechanisms. However, if the device A (505), for example, can be capable of interpreting the template B (509), and the license A (507), the device A (505) can issue a license B (503) to the device B (501), because a license based on template B (509) can be considered to include a subset of rights that can be issued in the license A (507). Advantageously, the license B (503) can be based on the template B (509), and can be explicitly encoded to generate a corresponding encoded license B (511) that the device B (501) can interpret. Accordingly, a general license, such as the license A (507), can be template mapped to devices, such as the device B (501), for example, which are resource-constrained by being able to interpret a limited amount of templates, or profiles. Accordingly, FIG. 6 is a flowchart illustrating exemplary template mapping processes of the sub-system of FIG. 5. In FIG. 6, at step  601, for example, a domain license can be obtained granting a home domain, such as a home computer network, an unlimited right to play, view, render or execute, a piece of identified content, such as a music file, movie file, image file or software file. The user can then requests, for example, from a master device, such as a personal computer on the home network, that the content associated with the domain license be played on a resource-constrained device, such as an MP3 player. According, at step  603, for example, the master device can query the slave device to determine the types of licenses, profiles, or templates that the slave device can support. At step 605, for example, the master device can determine that the slave device can not support the domain license, and, at step 607, for example, can retrieve a template corresponding to a license that the slave device can support, for example, from a template service, or from the slave device itself. At step  609, for example, the master device can issue a license that the slave device can support, based on the retrieved template. Advantageously, the slave device need not be capable of interpreting the domain license, but rather can be capable of interpreting the license issued at step 609. Advantageously, the issued license can include a subset of the rights specified in the domain license. At step  611, for example, the master device, the slave device, or another device, can be used to encode the license in any suitable manner, for example, as described with respect the exemplary embodiments. At step 613, the slave can receive a simple to interpret encoded license, which the slave can interpret at step 615 in any suitable manner, such as described with respect the exemplary embodiments. FIG. 7 further illustrates the exemplary rights expression encoding and decoding sub-system FIG. 3, based on such a license signature value  705. In FIG. 7, for example, a signature value 705 can be employed along with one or more values 701-703, as values for variables corresponding to a template or profile that can be extracted from a license 707, such the exemplary license L11. Advantageously, the license  707 can be encoded by transmitting the values 701-703 in the form of an encoded license 709 that can be delivered, to example, to a resource-constrained device. The values 701-703 can be used to populate the corresponding variables in a stored copy of a template, or profile to generate a decoded license 711. Advantageously, the signature value 705 can be restored into the corresponding variable fields of the corresponding template, profile, and the like, signature validation, authentication, and the like, techniques can be employed with the decoded license 711, such as according to the described exemplary embodiments, and the like. The exemplary signature technique, advantageously, can employed with a resource-constrained device that can encode the license  709, but may lack facilities, sign, or re-sign the encoded license 709, for example, because such device may not be part of a trust domain, or may not have sophisticated processing capabilities. In a further exemplary embodiment, however, an encoded form of a license can be signed, for example, using any suitable digital signature technique, such as according to the described exemplary embodiments. For example, FIG. 8 further illustrates the exemplary rights expression encoding and decoding sub-system FIG. 3 based on a signature value  805 for license variables 801-803. In FIG. 8, for example, if a device that can perform the exemplary encoding processes can be part of a trust domain, such a device convert an original license 807 to the encoded form 809, sign the encoded form of the license 809, and transmit the signature value 805 along with the variables 801-803. Advantageously, the signature value  805 can be employed to validate, authenticate, or ensure that the variables 801-803 are not tampered with, hacked, or compromised. Thus, the integrity, and validity of template identifiers, profile identifiers, and values for variables that can correspond to a template, or profile can be ensured, and trusted. Advantageously, a templatespace service can be deployed, via a number of methodologies, for example, including a computer network based service, such as a website, a service built into a resource-constrained device, and the like. For example, FIG. 9 illustrates an exemplary templatespace service  900 that can be deployed via a number of methodologies, for example, including a computer network-based service, such as a website or a service built into a resource-constrained device. In FIG. 9, a user can acquire content bound by a rich rights language on master device  901, such as a personal computer, via a license source 903. The user can receive as an update from a device manufacturer 905, a new bios, for a slave device 907, such as a handheld mobile mp3 player, that allows the user to properly treat the content with a new license template, such as a “play only during date a-b” type of template of the exemplary embodiments. For example, the new bios could support a number of new templates on the slave device 907. The device manufacturer can make templates available via a template service  909, such as a publicly accessible network service, and the like. When the user moves the content to the slave device 907, based on information from the slave device 907, the master device 901 can acquire a list of templates supported by the slave device 907 from the template service 909. The master device 901 can interpret the rights language from the templatespace network service 909, and determine that the new template supported can be appropriate for transferring the content from the master device 901 to the slave device 907. The master device 901 then can encode and issue a new license to the slave device 907 based on the exemplary license encoding techniques. In a further exemplary embodiment, a similar flow and rights lifecycle can be accomplished, but instead, wherein the manufacturer  905 makes the templates available on the slave device 907 itself. In addition, legacy devices or devices that have little or no support for DRM can employ an industry-created generic template that describes the behavior of such device. Advantageously, the legacy device would not receive a rights language of any form, but rather would treat content the same regardless of the source. For example, FIG. 10 illustrates an exemplary symbolic representation of the templates or profiles corresponding to Tables 3, 5, or 8. In FIG. 10, for example, an exemplary symbolic representation can be derived from a glyph structure, for example, based on a star-shaped structure, and the like, and can be used for expressing the templates or profiles corresponding to Tables 3, 5, or 8. In an exemplary embodiment, the symbols  1001-1004 derived from the star-shaped structure can be taken from the Red, Green, and Blue (RGB) color space. Thus, the symbols 1001-1004 of the star-shaped structure can include the Red (R), Green (G), and/or Blue (B) colors. Accordingly, in a basic case, wherein no colors can be combined, 12 symbols can be generated (for example, four symbols times three colors). To increase the number of members or symbols, however, complex symbols 1011-1019 having overlapping colors can be generated, as shown in FIG. 10. Thus, two or more symbols of different colors, for example, up to all 12 symbols, can be combined so as to overlap on a physical location, to potentially produce part or all of the star-shaped structure in different colors or combination of colors for each part of the star shape. For example, the color of the resulting horizontal symbol  1001 of the complex symbol 1011 can be based on the combination of Green and Red symbols 1001. In this way, the symbols 1001-1004, in various color combinations, can be used to generate the complex symbols 1011-1019, as shown in FIG. 10. Accordingly, the number of complex symbols in the exemplary symbol set illustrated by FIG. 10, for example, can be (2 12−1) or 4095 symbols, assuming that a blank space is not considered a symbol. Advantageously, with the numerous choices for the complex symbols provided by the exemplary embodiment, correspondingly complex and comprehensive symbolic representations of information, such as information for grammar, language, and the like, for a rights expressions can be generated. For example, as shown in FIG. 10, the exemplary rights expression  1021 can indicate the templates or profiles corresponding to Tables 3, 5, or 8. In FIG. 10, for example, the symbols 1011-1019 can be used to express the template or profile identification “1” followed the first cmid value “123” of the template or the number of pay load bytes “x” of the profile; followed by the second cmid value “456” of the template or the first cmid value “123” of the profile; followed by the third and final cmid value “024” of the template or the second cmid value “456” of the profile; followed by the third and final cmid “024” of the profile. In this manner, symbols can be generated and transmitted so as to represent templates or profiles corresponding to Tables 3, 5, or 8. The devices and subsystems of the Digital Rights Management system  100, for example, as described with respect to FIGS. 1-10, can communicate, for example, over a communications network 170, and can include, for example, any suitable servers, workstations, personal computers (PCs), laptop computers, PDAs, Internet appliances, set top boxes, modems, handheld devices, telephones, cellular telephones, wireless devices, other devices, and the like, capable of performing the processes of the disclosed exemplary embodiments. The devices and subsystems of the Digital Rights Management system 100, for example, can communicate with each other using any suitable protocol and can be implemented using a general purpose computer system. One or more interface mechanisms can be used in the Digital Rights Management system 100 including, for example, Internet access, telecommunications in any suitable form, such as voice, modem, and the like, wireless communications media, and the like. Accordingly, communications network 170 can include, for example, wireless communications networks, cellular communications networks, satellite communications networks, Public Switched Telephone Networks (PSTNs), Packet Data Networks (PDNs), the Internet, intranets, hybrid communications networks, combinations thereof, and the like. In addition, the communications network 170 can be the same or different networks. As noted above, it is to be understood that the Digital Rights Management system  100, for example, as described with respect to FIGS. 1-10, is for exemplary purposes, as many variations of the specific hardware used to implement the disclosed exemplary embodiments are possible. For example, the functionality of the devices and the subsystems of the Digital Rights Management system 100 can be implemented via one or more programmed computer systems or devices. To implement such variations as well as other variations, a single computer system can be programmed to perform the special purpose functions of one or more of the devices and subsystems of the Digital Rights Management system 100. On the other hand, two or more programmed computer systems or devices can be substituted for any one of the devices and subsystems of the Digital Rights Management system 100. Accordingly, principles and advantages of distributed processing, such as redundancy, replication, and the like, also can be implemented, as desired, for example, to increase the robustness and performance of the Digital Rights Management system 100. The Digital Rights Management system  100, for example, as described with respect to FIGS. 1-10, can be used to store information relating to various processes described herein. This information can be stored in one or more memories, such as a hard disk, optical disk, magneto-optical disk, RAM, and the like, of the devices and sub-systems of Digital Rights Management system 100. One or more databases of the devices and subsystems of the Digital Rights Management system 100 can store the information used to implement the exemplary embodiments. The databases can be organized using data structures, such as records, tables, arrays, fields, graphs, trees, lists, and the like, included in one or more memories, such as the memories listed above. All or a portion of the Digital Rights Management system  100, for example, as described with respect to FIGS. 1-10, can be conveniently implemented using one or more general purpose computer systems, microprocessors, digital signal processors, micro-controllers, and the like, programmed according to the teachings of the disclosed exemplary embodiments. Appropriate software can be readily prepared by programmers of ordinary skill based on the teachings of the disclosed exemplary embodiments. In addition, the Digital Rights Management system 100 can be implemented by the preparation of application-specific integrated circuits or by interconnecting an appropriate network of component circuits. whereby said rights expression information can be enforced on a device based on said variable and said identification for said profile. 2. The method as recited in claim 1, wherein said rights expression information includes conditions that must be satisfied in order to exercise a manner of use of said item on said device. transmitting said variable and said identification for said profile to a device adapted to enforce said rights expression information based on said variable and said identification for said profile. transmitting a plurality of variables associated with said identification for said profile in a predetermined order. transmitting a plurality of variables associated with said identification for said profile in a non-predetermined order. 6. The method as recited in claim 1, wherein said profile comprises a data structure. 7. The method as recited in claim 1, wherein said profile is associated with a company. 8. The method as recited in claim 1, wherein said profile is associated with a type of device. generating one or more low-level profiles from said high-level profile. 10. The method as recited in claim 1, wherein said device comprises a handheld device. 11. The method as recited in claim 1, wherein said device comprises a resource constrained device. 12. 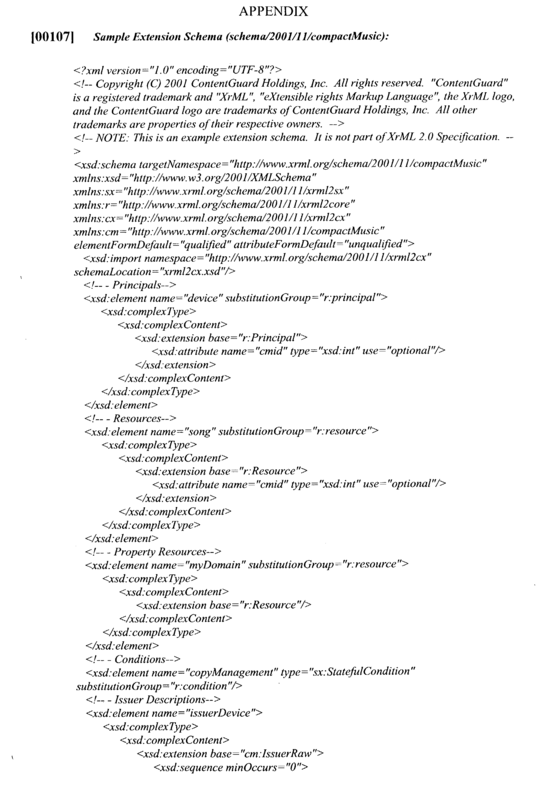 The method as recited in claim 1, wherein said device comprises a rendering device. 13. The method as recited in claim 1, wherein said rights expression information is grammar-based. 14. The method as recited in claim 1, wherein at least one of said rights expression information, and said profile comprises a glyph. 16. The system as recited in claim 15, wherein said rights expression information includes conditions that must be satisfied in order to exercise a manner of use of said item on said device. means for transmitting said variable and said identification for said profile to a device adapted to enforce said rights expression information based on said variable and said identification for said profile. means for transmitting a plurality of variables associated with said identification for said profile in a predetermined order. means for transmitting a plurality of variables associated with said identification for said profile in a non-predetermined order. 20. The system as recited in claim 15, wherein said profile comprises a data structure. 21. The system as recited in claim 15, wherein said profile is associated with a company. 22. The system as recited in claim 15, wherein said profile is associated with a type of device. means for generating one or more low-level profiles from said high-level profile. 24. The system as recited in claim 15, wherein said device comprises a handheld device. 25. The system as recited in claim 15, wherein said device comprises a resource constrained device. 26. 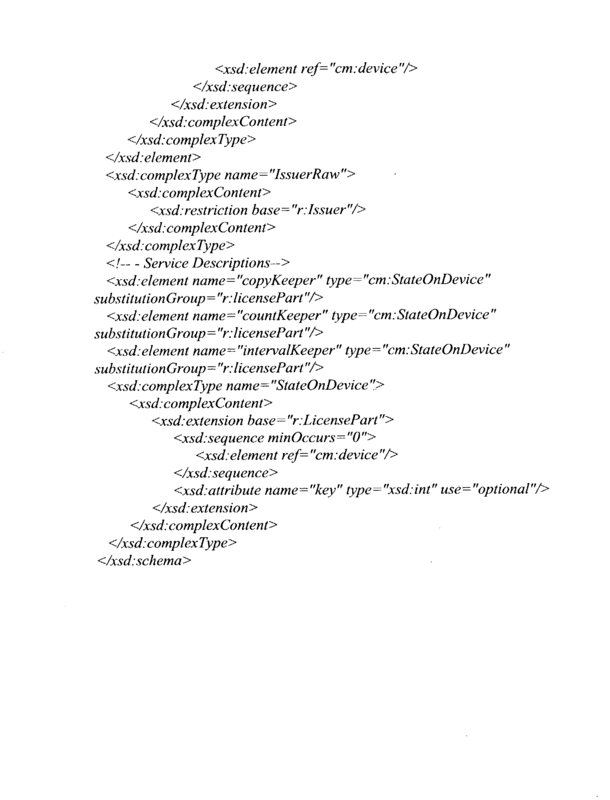 The system as recited in claim 15, wherein said device comprises a rendering device. 27. The system as recited in claim 15, wherein said rights expression information is grammar-based. 28. The system as recited in claim 15, wherein at least one of said rights expression information, and said profile comprises a glyph. 29. The system as recited in claim 15, wherein said means for specifying, said means for generating said profile and said means for generating said identification comprise devices of a computer system. 30. The system as recited in claim 15, wherein said means for specifying, said means for generating said profile and said means for generating said identification comprise computer readable instructions recorded on a medium.